Looking for indispensable tools for development, testing and debugging? We’ve got you covered. 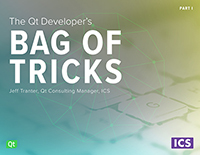 In this two-volume eBook, Qt Developer’s Bag of Tricks, we share the tools the development team here at Integrated Computer Solutions (ICS) finds incredibly useful. The focus is on (mostly open source) tools applicable to Qt developers programming in C++ or QML for desktop, mobile and embedded platforms. Be on the look out for Part 2, coming later this summer.